Support our complete transportation system. Historically we have funded public transportation, rail, bike and pedestrian infrastructure, and trails by putting money through the full Act 51 formula. The House legislation would bypass all other transportation infrastructure and just send money to roads and bridges. The Senate has the opportunity to change this. Find a sustainable, dedicated funding source that does not pull money from other important Michigan priorities. Michigan’s transportation system is in crisis, but that doesn’t mean that other Michigan programs and services don’t also need their designated funds. Taking money from things, like our economic development programs, will only hurt other aspects of Michigan’s comeback. In order to continue funding transportation adequately, funds need to come from a sustainable source so we don’t face this crisis again. Create enough new revenue to meet the real needs of building and maintaining a 21st century transportation system. We need an estimated $1.2 billion annually just to fix our roads. 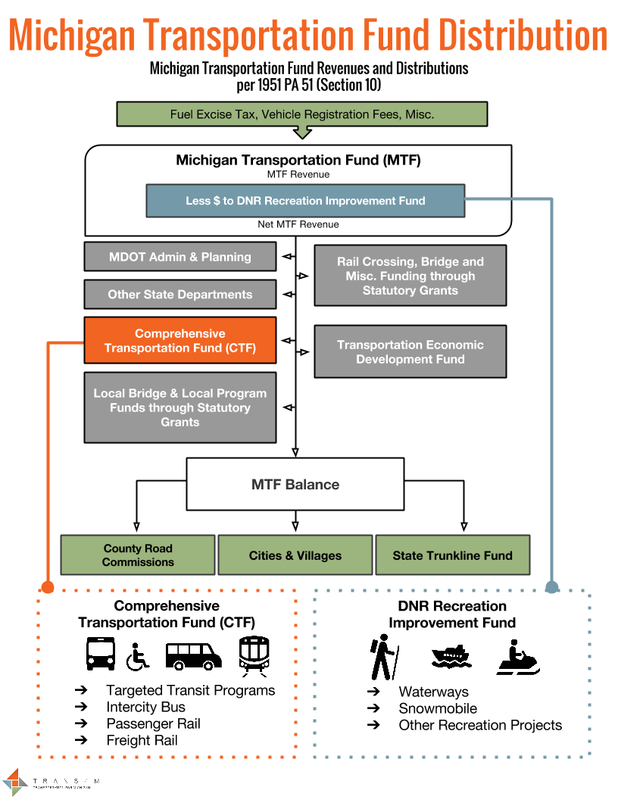 If we are going to experience the benefits of a robust transportation system, we have to find at least this much, and to do so we must look at creating new revenue instead of relying solely on funding dedicated to other Michigan priorities. Each week, advocates are going to focus on one of the above messages. The first week, spanning June 15-19, the message is support our complete transportation system. If this message is important to you (and we hope it is! ), you can participate by sharing this message with your senator. Get in touch with your senator. Call, email, or write to tell them to put all money through the full Act 51 formula. Then, next week get in touch again around message point 2. Then do it again during week 3 and 4. Let the Senate know that we need well-funded options to get to the places we need and want to go. Not sure who your senator is? Look it up here. Share these graphics. We all know that having multiple transportation options beyond driving our cars is helpful for our health, pocketbook, and well-being. But do you know how beneficial it is for your community and Michigan? 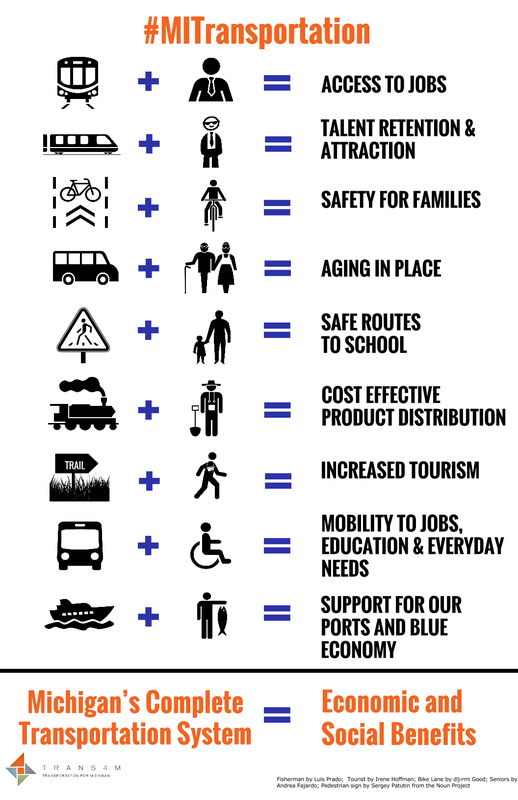 Use these helpful graphics to share how valuable it is to have a strong bus system, safe bikeways, and more. Sometimes a picture is worth a thousand words. Use this power to communicate your message. 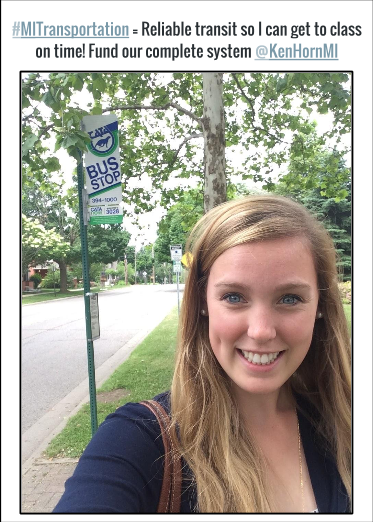 Take a selfie with your preferred transportation option, whether that is your favorite bike lane, public bus, trail or walkway. Then share that with the masses. 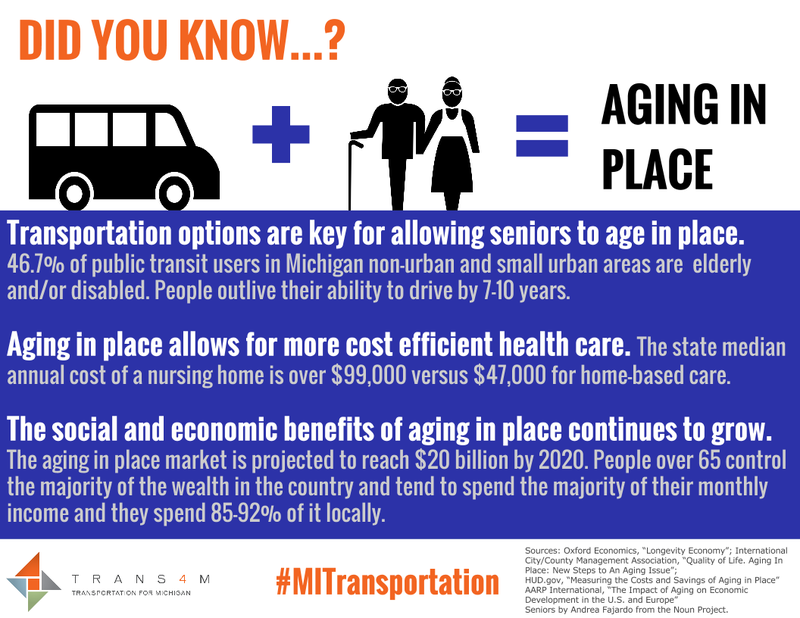 On Twitter and Facebook, use #MITransportation = and tell us why you choose this means of getting around. And don’t forget to tag your senator! Spread the word and have your friends participate. Legislators really do listen to their constituents, so make sure your voices are heard loud and clear. The more people who participate, the louder the message. Funding transportation is a priority for the state that needs to be resolved – not only just right away, but in the right way — if Michigan is going to have a 21st century transportation system. Now is your chance to shape what that solution will look like.